One of my fondest memories as a child would be the trip to the news agents/sweet shop on the way home from school! Here you would be greeted with all kinds of sugared goodies all in a colourful row, and with empty tub in tow you would start to choose handfuls of assorted sweets which would only cost you between 1&2p! Oh no, there was no messing around with weighing, nope you had your pocket money in hand and would choose accordingly to how much you had to spend. Some of my favourite finds would be white mice, foam mushrooms, strawberry laces and fizzy cola bottles. So in cheerful reminiscence and because we simply love all things sugar coated, we here at SewSmitten HQ have created some colourful sweetie covered cardholders! 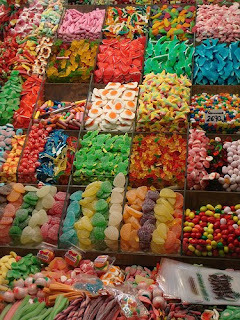 We spent a few days gorging ourselves on some of the classic Pick & Mix sweeties (Ooo isn't our job so hard!!) and have chosen 8 of our favourite to be turned into colourful cardholders. So tell us which is your favourite sweet? To view the whole collection go take a look online!